Pure Taqueria is planning to add new locations in Newnan and Columbus. The Alpharetta-based restaurant chain plans to open at Ashley Park in Newnan in August and on Veterans Parkway in Columbus later in the year. The chain has existing locations in Alpharetta, Brookhaven, Duluth, Inman Park, Roswell and Woodstock. Academy Sports & Outdoors confirmed in March that it plans to open a new store at Buford Gateway, a new development at the corner of Plunkett Road and Buford Drive (GA Highway 120) in Buford. The new store is expected to open later this year. A freestanding Texas Roadhouse Steakhouse opened late last year as part of the project. Gong Cha, a tea joint, and Kremo, a rolled ice cream shop, are now open at 6135 Roswell Road in Sandy Springs. The two businesses will also open in adjacent spaces later this summer in Peachtree Corners Town Center in Peachtree Corners. Fork in the Road is now open in the former Wendy's on LaVista Road near Northlake Mall. The locally owned restaurant was previously located in the former Ruby Tuesday's/Crescent Moon at the front of Northlake Mall. 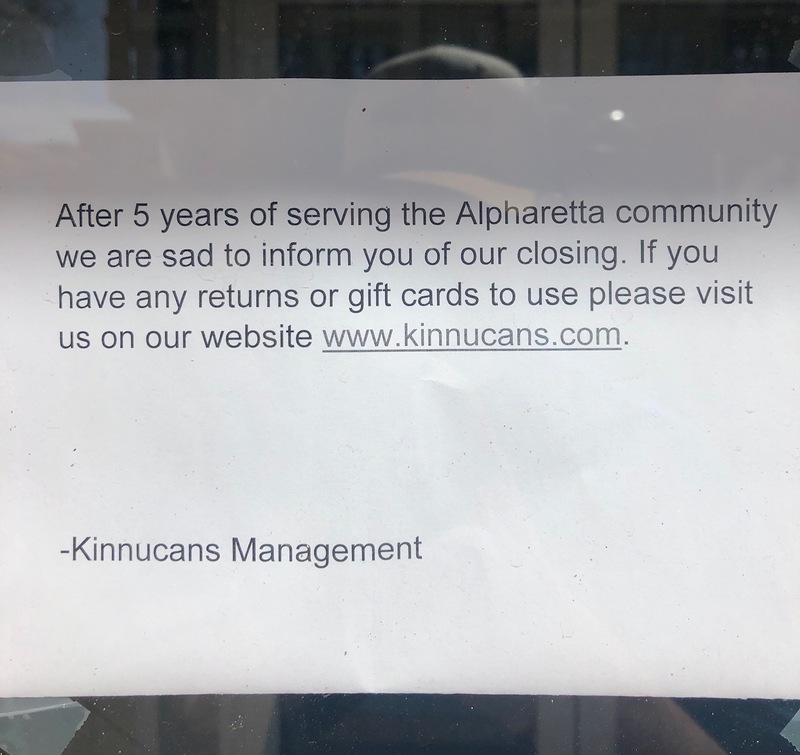 Kinnucan's has closed its store at Avalon in Alpharetta. The store opened as part of the mixed-use project in 2014 and closed earlier this week according to signage at the store. The Auburn, Alabama-based specialty outfitter opened in Newnan's Ashley Park in 2015 and quietly closed last month. Also last month, the retailer closed a twelve year old store in Tuscaloosa's Midtown Village. 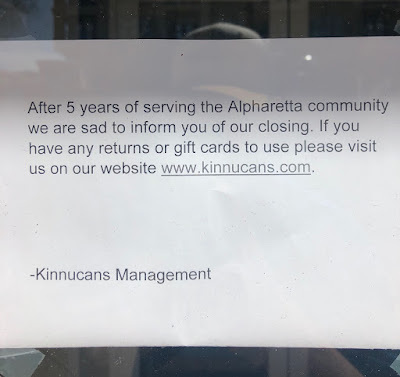 Kinnucan's closed its store in Atlantic Station early last year, having opened it in 2014.  Local franchises of Jamba Juice in Buckhead and Decatur are currently being marketed for sale by The Shumacher Group. The eateries, located in Chastain Square and North Decatur Center, opened in late 2015 and early 2016, respectively. The listing indicates that they are being offered as "keep [as juice/smoothie bar] or convert." The franchise is not included in either sale and the business would need to continue under another brand, franchise or otherwise. Another Jamba Juice eatery in Alpharetta previously closed, while others in East Cobb and Sandy Springs were previously sold by Shumacher and remain open. This past fall, Jamba Juice was purchased by Atlanta-based FOCUS Brands, owners of such franchises as Moe's Southwest Grill, Cinnabon and Carvel, among other concepts. A new Dollar Tree is coming to a one time Pier 1 Imports along Memorial Drive in Stone Mountain. The new store will open at 6050 Memorial Drive in an out-parcel of Hairston Village shopping center. Originally built as a Pier 1, the building was most recently home to a Pet Supermarket. Dollar Tree plans to renovate the roughly 9,000 square foot building and reopen later this year. Dollar Tree will also open a new store at 12155 Houze Road in Roswell in a freestanding former Rite Aid. Greater Good BBQ on Howell Mill Road on the Westside is no longer open to the public and is now catering only. A new location of quick-serve pizza joint Your Pie is planned for The Shops at Belmont near the corner of Windy Hill and Atlanta Roads. The new location will join F45, a fitness facility, and Real Subs, a local sandwich shop, in phase two of the development. Athens-based Your Pie has more than a dozen locations in the greater metro Atlanta area including one of their newest on Chamblee Tucker Road at Embry Village shopping center. Kuroshio Sushi & Lounge at Midtown Plaza at 950 West Peachtree Street has closed. The restaurant, which opened in place of similar restaurant Steel in early 2017, closed as of February 23. 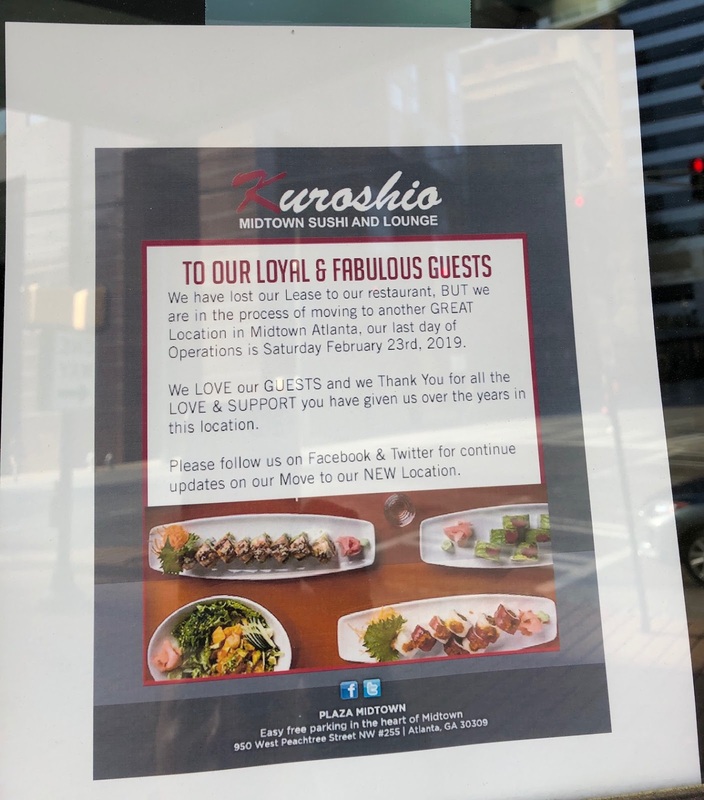 Kuroshio locations remain open in Cumberland and Kennesaw. According to signage on the Midtown restaurant's door and social media, the owners were as of February, "in the process" of "moving" to another Midtown location. Over a month later, however, there is nothing to substantiate the claim. A new Moe's Southwest Grill is coming to Elijay and it, like a renovated location in Sandy Springs and a new location in Kennesaw, will sport the Atlanta-based brand's latest design concept and logo. An additional new look Moe's is planned for Colony Square in Midtown where the eatery previously operated a location. Sweetwater's Coffee & Tea is now open at TOWN Brookhaven. After countless delays, the Crazy Cuban Sandwich Shop reopened in late February on 14th Street near Georgia Tech. New locations of Planet Fitness are coming soon to Dawsonville and Stockbridge. In Dawsonville, Planet Fitness will open a 16,800 square foot facility in a portion of the former 71,000 square foot Kroger store. In late 2016 Kroger relocated from Dawson Village to the new Dawson Marketplace shopping center nearby where it opened a nearly 124,000 square foot Marketplace store. In Stockbridge, Planet Fitness will open in a new 20,000 square foot out-parcel of Freeway Junction shopping center along GA Highway 138. A new Chase Bank is coming to the former Keba Sandwiches/Yogli Mogli at 1403 Oxford Road in Emory Village. The bank reportedly wanted desperately to be in the market and was willing to pay the price to be a stone's throw from Emory University, despite not having the capability of having a drive-thru. Del Taco is planning to open a new location on GA-85 in Riverdale. The new approximately 2,400 square foot restaurant will sit on a roughly .60 acre lot and is expected to open in early May. California-based Del Taco has in recent months opened a number of new restaurants in Georgia in Hiram, Douglasville, Calhoun, Gainesville and Roswell, and has additional units planned for Fayetteville, Loganville and Conyers. In both Hiram and Gainesville, Del Taco renovated former Pollo Tropical restaurants. Sources indicate that it is highly likely that Del Taco will also pursue the shuttered Pollo Tropical on LaVista Road in Tucker as they have sought space in the area for some time. Tin Drum Asian Kitchen has temporarily closed its North Druid Hills Road restaurant for a limited renovation. 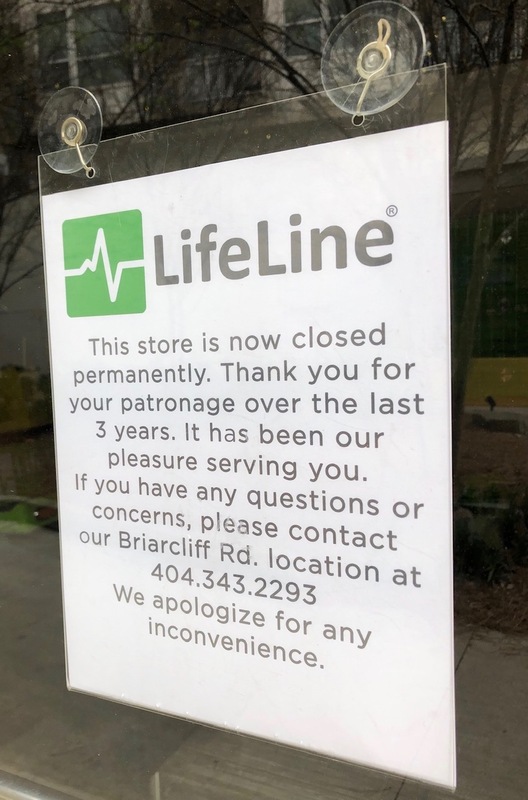 The restaurant, located near the corner of North Druid Hills and Briarcliff Roads in the Village at Druid Hills center, has been closed since February and was expected to reopen March 1, April 1, and is now targeting "mid April." Another Tin Drum is expected to open late this year in Pooler, a suburb of Savannah, at the Tanger Outlets center. Ali's Cookies Dunwoody at Perimeter Place has reopened after being closed for a month or so for unspecified reasons. Although the shop has reopened, it's under abbreviated hours as the business deals with staffing challenges that have made maintaining a standard schedule difficult. Boutique pet store Pet People is opening a pair of new locations in metro Atlanta, their first in the state. 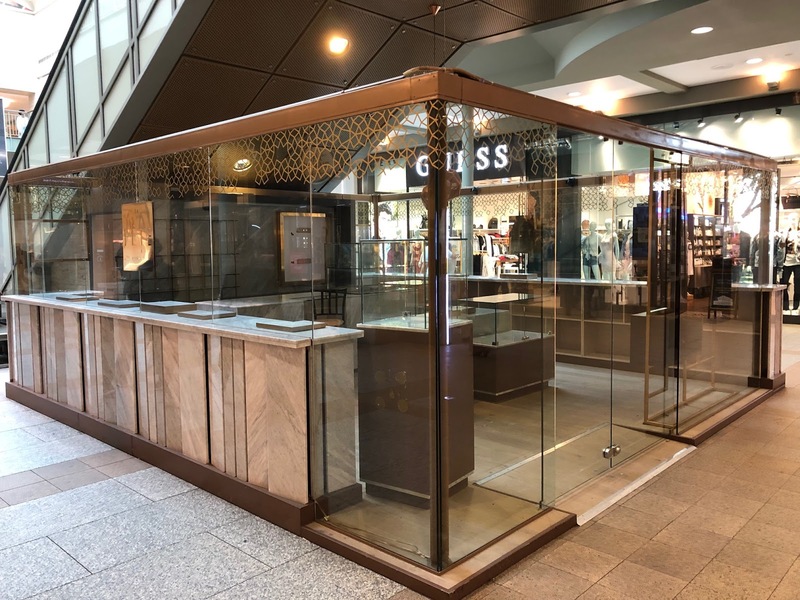 The new shops are coming to Fountain Oaks shopping center in Sandy Springs and Peachtree Battle shopping center in Buckhead. Based in the greater Columbus area of Ohio, Pet People most closely competes with Memphis-based Hollywood Feed which now has 21 stores in Georgia. The Sandy Springs location opened last month and is 4,447 square feet, and the Peachtree Battle location, which replaces shuttered Japanese eatery Maki Fresh, is 3,390 square feet and is expected to open later this summer. Clarks has closed its store at Cumberland Mall in Smyrna. The footwear retailer remains open at Perimeter Mall in Dunwoody, North Point Mall in Alpharetta, Mall of Georgia in Buford and Lenox Square in Buckhead. Clarks also operates outlets at The Outlet Shoppes at Atlanta in Woodstock, Tanger Outlets in Locus Grove and Commerce and North Georgia Premium Outlets in Dawsonville. Navy Federal Credit Union is opening a new branch in the former SunTrust Bank at Roswell Road and Cliftwood Drive in Sandy Springs. SunTrust relocated last year to the site of a former Wendy's at the corner of Johnson Ferry and Roswell Roads. A new Burlington store is opening at Mansell Crossing on North Point Parkway in Alpharetta. The new approximately 45,000 square foot store will open in the former Toys R Us space. CenterState Bank officially made their debut in metro Atlanta last month with the conversion and rebranding of former Charter bank branches. 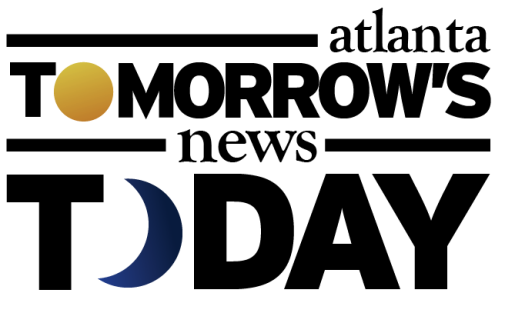 The acquisition of Charter, which had themselves recently purchased Resurgens, brought Davenport, Florida-based CenterState to Tucker, Decatur, Sandy Springs, Peachtree Corners, Smyrna and Marietta, among other communities. Pao Pao Ramen and Pao Pao Rolled Ice Cream are now open at Toco Hills. The twin eateries opened in a shared space near Kale Me Crazy and Spiller Park, all occupying portions of the former Shoe Center store. Harp Irish Pub has closed at Plaza at Roswell Shopping Center at 1425 Market Boulevard in Roswell. Adult entertainment venue Onyx has closed temporarily according to signage at the Cheshire Bridge Road business. Another new player in the "bowl game," Rush Bowls, recently opened its first ever Atlanta area location along Peachtree Dunwoody Road at Hanover Shoppes at Perimeter Town Center in Sandy Springs. The new shop opened alongside Grub Burger Bar in the street level retail of the Hanover Perimeter apartment community. La Fête Chocolat, one of South America's largest high-end chocolate manufacturers, has closed its mini store at Lenox Square in Buckhead. The shop, located in a kiosk-like cube just outside the first floor entrance of Bloomingdale's, opened in late 2016 and closed in February. Chocolate shops Sugarfina and Godiva remain open in the mall. Rooms To Go plans to bring its newly created Rooms to Go Outdoor banner to Kennesaw later this summer. The new store, located at 835 Ernest Barrett Parkway, will open across the street from the brand's namesake store at 964 Ernest Barrett Parkway. Rooms to Go Outdoor will open in place of Spa Sydell, and according to Cobb County building permits, will occupy about 9,400 square feet and cost about $210,000 to build out. Seffner, Florida-based Rooms To Go acquired Florida-based Carls Patio last year to launch themselves into the outdoor furniture business. Existing Carls Pario stores are slated to be rebranded as Rooms To Go Outdoor in the coming months. Additional Rooms To Go Outdoor stores are likely in metro Atlanta and other existing markets. ToNeTo Atlanta previously reported that Rooms To Go is spending nearly $2 million renovating their Buckhead store at the corner of Peachtree and Piedmont Roads. Popular dim sum restaurant Royal China plans to "soon" relocate from Chamblee Dunwoody Road in Chamblee to Satellite Boulevard in Duluth. In Duluth, the new Royal China will occupy the former Golfsmith store near Ollie's Bargain Outlet. We say "soon" as the restaurant has been delayed repeatedly in their relocation for unspecified reasons. Struggling department store JCPenney plans to close 15 full-line department stores and nine home and furniture stores this year. The full-line stores are expected to close by July 5, according to a company release. In Georgia, the moves will lead to the closing of the full-line JCPenney at Glynn Place Mall in Brunswick. JCPenney has in years past also closed stores at Cumberland Mall near Smyrna and Perimeter Mall in Dunwoody. Both stores were demolished with the Cumberland property now occupied by a non-mall connected Costco store and fuel center, and the Perimeter store now occupied by a Dillard's as part of the mall. American Family Care (AFC) Urgent Care has closed at The Prado in Sandy Springs. Signage on the medical facility's door invites would-be patients to visit other area locations including those in Peachtree Station in Chamblee and in the same building as Piedmont Heathcare on Howell Mill Road on the Westside. AFC's closure is just the latest in a growing list of failures at the development. The freestanding building where AFC was located previously lost Barberitos and Yogurt Mountain. A Bruegger's Bagels planned for the parcel never opened. According to signage at the restaurant and the corporate website, the Steak & Shake at 2905 Stonecrest Circle near Stonecrest Mall in Lithonia has "temporarily closed." Local boutique Made Again and mobile device repair shop LifeLine Repairs closed earlier this month at Inman Quarter in Inman Park. The center has been great for restaurants like Bread & Butterfly, Hampton & Hudson, Char and BeetleCat, but retail has struggled.. With that in mind, we here at ToNeTo Atlanta encourage you to support our friends at Select Shades, a great locally-owned alternative to mega-chain Sunglass Hut. The Real Mexican Vittles dba D Boca N Boca, a Mexican street food purveyor, will be opening in a 1,760 square foot freestanding building at 39 Georgia Avenue that will also feature a 880 square foot patio. The new restaurant joins a growing list of eateries coming to the 83-acre mixed use development. Owner Helio Bernal, Jr. grew up in his family's Hispanic grocery distribution business El Jarocho, but he branched off on his own in April 2017 with the launch of The Real Mexican Vittles. Bernal describes his food as "authentic and delicious Mexican bites that take our customers on a trip across the border through our savory experience!" Steve Josovitz of The Shumacher Group, Inc. represented Bernal in the lease at Summerhill. A release announcing the completion of the lease refers to D Boca N Boca as "a full-service Mexican Gastro Pub Restaurant and Taqueria with a cutting edge beverage program a stunning outdoor patio in a freestanding brand new buildout in the heart of Summerhill." The Little Tart Bakeshop opened this past January, and will be followed in May by the opening of Big Sofie, a soft-serve ice cream shop. Both businesses are owned by Sarah O'Brien who also operates Little Tart locations in Octane Coffee on Memorial Drive in Grant Park and in Krog Street Market. Wood's Chapel BBQ from the group behind The General Muir, West Egg Cafe and Yalla and Fred's at Krog Street Market, is also opening in the project, as are Hodgepodge Coffee, Halfway Crooks Brewing and Blending, and Little Bear, from Eat Me Speak Me's Jarrett Steiber. REI recently announced plans to open the second of two planned Alabama locations at The Summit in Birmingham. The new 20,000 square foot store will occupy a portion of the former Toys R Us/Babies R Us in the mixed-use development. The 56,000 square foot "R" Us Superstore opened in the project in 2011, replacing what had previously been a Bruno's grocery store, which had closed in 2009. The Birmingham location is slated to open in October preceded by another location, the first in the state, planned for MidCity Huntsville, a new redevelopment of the former Madison Square Mall property in Huntsville. REI operates five locations in metro Atlanta including those in Alpharetta, Brookhaven, Buford, Sandy Springs and Kennesaw. No surprise about Greater Good. An impossible location but people keep trying and failing. Sweetwaters Coffee at Town Brookhaven is a nice place. However the hours have been reduced since the opening. Currently 7 AM to 9 PM vs 6 Am - 10 PM Early birds have to trek to the evil starbucks. Is a Dollar Tree opening a positive or a negative for a community? Any updates on the Bell Street Burritos in Tucker?